Front line apartment with wonderful sea and harbour views. The property consists of: 2 Bedrooms, shower room, lounge/diner, kitchen and terrace of 10m². A detached bungalow on a large plot in the very popular residential area of La Goleta. Plot of 750m² located 450m from the marina and with outline planning permission to build 25% (187.5m²) plus underground/basement. Detached house with 2 bedrooms, 2 bathrooms, lounge/diner, kitchen, utility room/storage area, balcony and annex with bedroom, kitchen and bathroom. One of the last plots of absolutely prime building land on Montana Roja. Plot size 1,510m2, priced substantially lowered to 215,000€. Semi-detached villa in the Los Altos área. Beautifully renovated apartment on a very good frontline complex with a large pool. Comprising of: 2 bedrooms, bathroom, lounge / diner / kitchen, utility room and terrace with sea views. 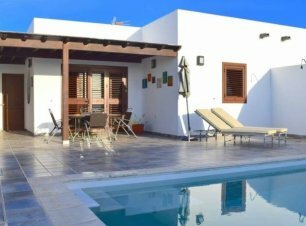 Located in one of the most sought after areas of Playa Blanca, this family home is only a short walk from the town centre and beaches. Standing on a corner plot near to the local facilities and only a short walk to the coastal path and the Rubicon Marina, this well maintained duplex is beautifully presented. New development near the marina Rubicon. Selection of two and three bedroom duplex. PRICE REDUCTION. This luxury villa, tastefully furnished and very spacious both inside and out has an excellent rental history and will be sold with forward bookings. SUPERB VALUE A spacious and modern semi-detached villa with a stylish living/dining area which has patio doors leading out to the private swimming pool and ample terrace area.